Lambertson '98 [Druid's Chant x Sea Urchin] 5.5" Semi. Ev. Re. Em. 27" Tet. A beautiful blue lavender with a white star burst coming out of a green throat and gold edging. Great parent, producing sharks tooth edging. “Sandy Denny” is a variety of daylily (hemerocallis) hybridized by Ludlow Lambertson in 1998. Luddy and his wife Rachel describe themselves as “huge fans of both Sandy and Fairport Convention”, hence the choice of name. Rachel sings; Ludlow is the hybridizer; both are painters. Based at Lake Helen, Florida, they open their garden to the public during daylily bloom season, which runs from May to June (details on their website at Art Gallery Gardens). What you won’t find on display, alas, is the “Sandy Denny” bloom. They no longer have it. And nor does anyone else, as far as I can establish. A website in Canada, Rural Roots Gardens, purports to offer it for sale, but the illustration is incorrect (it shows another of Lambertson’s hybrids, “Do The Twist”) and my enquiries have gone unanswered. Some years ago a horticulturalist in south London contacted me, saying she was planning to import “Sandy Denny”. I met her when she came to the Troubadour tribute in 2008, but failed to keep in touch, alas. I wonder if she succeeded? Kyle Orosz, who designed the authoritative Sandy website at www.sandydenny.org.uk, incorporated the flower into his illustrations. Do we know any more about this elusive bloom? I have put a call out on a gardening forum I am a member of to see if anyone can help. Thanks, Mr Gremlin. Let us know if anything emerges. In fall 2014 we received a small clump of our daylily SANDY DENNY back from someone in the U.S. who was still growing it and we hope to multiply it again in our garden. Great news, Rachel! Keep us informed of progress. Best, Philip. Hi Phillip, Sorry for posting twice, wasn't certain the first one had gone through. 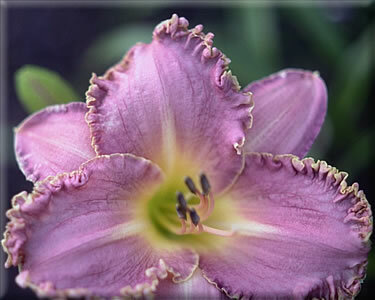 We should see some bloom from our flower in MAY which is daylily season here in Florida. I'll try to send some photos!